A simple and elegant hand lettered Father's Day card designed for the stationery lover. Show your love this Father's Day with our brand new 'Love You Dad' Father's Day card. Simple and classic without the cheese! Our unique, contemporary and eye catching design is created by hand using a Japanese brush pen and rich black Indian ink, printed on to the finest and extra luxurious FSC certified 350sgm textured card and teamed with a recycled kraft envelope. 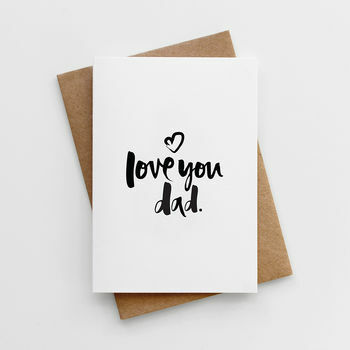 'Love You Dad' Father;s Day Card is 10.5 x 14.8cm (A6) and comes with a 11.4 x 16.2cm (C6) envelope.